This instrument is made up of two grooved and graduated arms and a protractor located at the pivot. 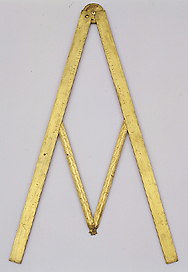 The work of the English instrument-maker James Kynvyn, it is an early form of the instrument that would subsequently be developed as the sector: one side carries two pairs of sectoral scales. The arms contain two flat runners that can be pulled out and joined at a right angle to form a shadow square. In this way, by means of these different combinations, the instrument could be used to measure heights and distances. Like most of the other English instruments conserved in the Museum, this instrument originally belonged to the bequest of Robert Dudley.